Heathrow Airport is to be serviced by a second Emirates A380 double-decker jumbo jet which offers passengers the ultimate luxury flight experience. Emirates currently operates 1 service a day on the state-of-the-art 517 seat Airbus A380 aircraft from Terminal 3 at Heathrow Airport with a daily departure of 14.15. From 1st July 2010, an extra flight per day will depart from the travel hub. 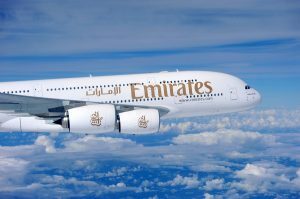 The new service will depart from Heathrow to Dubai at 20:40 GMT and arrive in Dubai 06:30 GMT the next day. Emirates first brought the double-decker mega jumbo, equipped with an onboard lounge and shower spas, to London in December 2008. Among the luxury facilities on board are 14 first class private cabins with electrically operated doors, 76 fully flat seats in business class with mini-bars and over 1,000 entertainment channels and 427 economy seats which are spread across 4 cabins on the lower deck. Personal satellite phones are also fitted in each seat, which offer text messages and email, as well as a facility where people can view their photos.